Blending family and business can provide the best possible working environment for those who do it right. The challenges may be greater, but so are the rewards. The winners of the 2013 Family Business Awards have figured out how to make the combination work for themselves, their employees and their customers. Winners were selected by the Cox Family Enterprise Center at Kennesaw State University; the recognition program is sponsored by the center and Georgia Trend. Ed Voyles Automotive Group, based in Marietta, is the large business winner. Forest Park’s General Produce, Inc., a wholesaler, is the medium-sized business winner. Hill Aircraft & Leasing Corporation, Atlanta, a full-service fixed-base operator offering sales, maintenance and charter services, is the small business winner. Haverty Furniture Companies, established in downtown Atlanta in 1885, is the Century Award winner. For these businesses, employees are typically regarded as family and always treated with respect. “We try to treat our associates like we would like to be treated,” says Valery Voyles. Finalists in this year’s competition are RaceTrac Petroleum, Inc., Norcross, and Pharma Tech Industries, Royston, large category; Repro Products, Smyrna, and ComSouth Communications, Hawkinsville, medium; and Moon’s Pharmacy, Tifton, and Atlanta Light Bulbs, Inc., Tucker, small. Presented with the choice of undergoing a root canal or buying a car, a surprising number of people might choose the dental procedure. Valery Voyles, chair and CEO of Marietta-based Ed Voyles Automotive Group, the 2013 Cox Family Enterprise Center Family Business of the Year Award winner (large business category), strives to eliminate the unpleasant feeling associated with purchasing a car one customer at a time. Founded as a used car dealership in East Point in 1952, the company has transformed over the years, first by adding new vehicles to its inventory in the mid 1950s and later by relocating to Cobb Parkway in 1970 just as Marietta began to grow in commercial and residential development. By the time Ed Voyles died in 2004, his company operated over a half-dozen franchises. 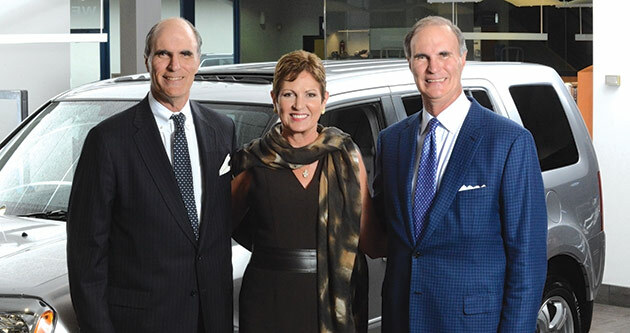 Today, the business consists of eight franchises (Acura, Chrysler, Dodge, Ram, Honda, Hyundai, Jeep and Kia), three locations and 503 employees, including two generations of the Voyles family. Presently, Valery’s brothers Bill and Ben are vice presidents and partners in the company, though Bill divides his time between work and philanthropic endeavors. As the trend in automotive retail has shifted toward an increase in public companies, Valery aims to maintain a family-owned business. The next generation, Bill Voyles Jr. and Jessica Singleton, Valery’s daughter, currently work for the company. “I’d like to see my dad’s legacy continue to the next generation,” says Valery Voyles. The company has experienced a surge in sales in recent years, highlighted by a record-breaking year in 2012 with the sale of 12,272 cars (7,488 new cars and 4,784 used cars sold), which yielded $473 million in revenue. This year could be even more profitable for the company, as new car sales were up five percent over 2012 and used cars sales were up three percent at the end of August. Building strong relationships with customers and em-ployees was Ed Voyles’ blueprint for success in the automotive retail business, and it remains a top priority for the company. Loyalty to employees and promotion from within are signature company values. Today, Ed Voyles Automotive boasts 101 employees with tenures of 10 years or more, including four employees with 30 or more years of service. When the Folds family purchased a Forest Park produce company in 1977, it had already been a family-owned business for 24 years. Since then the company, christened General Produce Inc., has been ranked several times among Georgia’s top 100 privately owned family businesses, in terms of revenue, thanks in large part to leadership provided by each generation. General Produce has 250 employees on the payroll, up slightly from the end of 2012, with plans to expand into Florida and add more workers. The Atlanta Farmers Market-based company is known for its donations of produce and cash to area nonprofits, such as the Southern Crescent Resource Ministry food bank and the Atlanta Community Food Bank. “We give product to the local hospitals for their nurses appreciation day,” Springfield says. The company employs nine family members, with four of them on its board of directors; and there are other kinds of family connections outside the Folds. General Produce may soon have a presence in the Florida Panhandle, according to Spring-field. “We’re in negotiations with a company there,” she says. “It’s a meat company, because we want to get into food service and distribution down there.” Spring-field says the Panhandle restaurant market has opened up due to the recent closing of a large food service distribution company in the area. James Joseph Haverty set up a furniture store in downtown Atlanta in 1885, selling tables, chairs and wares to a populace still struggling to recover from the effects of the Civil War. Nearly 130 years on, some things have changed. Haverty Furniture Companies Inc. has been publicly traded since October 1929 and has grown into one of the nation’s largest furniture retailers. Other things remain constant. Havertys is still a family affair, in many ways, as the company is run by descendants of J.J. Haverty, as he was known. Haverty descendants control three-quarters of the company’s voting stock. The company’s chairman, president and CEO, Clarence Haverty Smith, is J.J. Haverty’s great grandson. Smith is joined by other family members in the corporate suites and on the board. Cousin Rawson Haverty Jr. is senior vice president of real estate and development and a board member. Another cousin, Frank S. McGaughey III, serves on the board of directors. Yet another Haverty is in management training. As a family company, Havertys is the recipient of this year’s Cox Family Enterprise Center’s Century award for family businesses more than 100 years old. Smith says because the company is public, he wasn’t sure it was appropriate to take the award. However, Havertys is still very much his ancestors’ firm, governed by the sober financial principles that sustained the company through world wars, the Great Depression and most recently the worst economic downturn since World War II. For example, Smith points out, the company carries no debt. “Our ancestors were very conservative,” he says. “They didn’t do anything radical. We play that up a lot” in marketing. Havertys is prospering. With 120 showrooms in 16 states in the South and Midwest, the company reported $171.1 million in net sales in the second quarter, up 12.9 percent from the same period in 2012. Sales for all of last year were $670.1 million, placing Havertys among the nation’s largest furniture companies. Havertys historically handled its own consumer credit in-house. But based on advice from Wall Street, the company outsourced its consumer credit operation in 2001. If it seems Havertys sports a different look these days, it does. The stores are carrying more trendy furnishings, higher-end pieces and accessories at a higher price point than it historically has, departing at least in this aspect from the founder’s saying “The store had only one price: anything we could get.” Havertys now offers more contemporary and casual furniture and is upholstery-focused, Smith says. “We saw an opportunity to upgrade without leaving the core customers behind,” he says.